United Press International (UPI) is an international news agency whose newswires, photo, news film, and audio services provided news material to thousands of newspapers, magazines and radio and television stations for most of the 20th century. At its peak, it had more than 6,000 media subscribers. Since the first of several sales and staff cutbacks in 1982, and the 1999 sale of its broadcast client list to its rival, the Associated Press, UPI has concentrated on smaller information-market niches. Formally named "United Press Associations" for incorporation and legal purposes, but publicly known and identified as United Press or UP, the news agency was created by the 1907 uniting of three smaller news syndicates by the Midwest newspaper publisher E. W. Scripps. It was headed by Hugh Baillie (1890-1966) from 1935 to 1955. At the time of his retirement, UP had 2,900 clients in the United States, and 1,500 abroad. In 1958 it became United Press International after absorbing the International News Service (INS). As either UP or UPI, the agency was among the largest newswire services in the world, competing domestically for about 90 years with the Associated Press and internationally with AP, Reuters and Agence France-Presse. It now maintains a news website and photo service and electronically publishes several information product packages. Based mostly on aggregation from other sources on the Web and gathered by a small editorial staff and stringers, UPI's daily content consists of a newsbrief summary service called "NewsTrack," which includes general, business, sports, science, health and entertainment reports, and "Quirks in the News." It also sells a premium service, which has deeper coverage and analysis of emerging threats, the security industry, and energy resources. UPI's content is presented in text, video and photo formats, in the English, Spanish and Arabic languages. 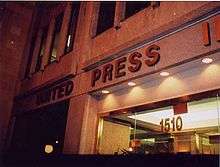 UPI's main office is in Washington, D.C.; it maintains office locations in five other countries and uses freelance journalists in other major cities. Scripps' United Press was considered "a scrappy alternative" news source to the AP. UP reporters were called "Unipressers" and were noted for their fiercely aggressive and competitive streak. UP (and later UPI) became a common training ground for generations of journalists. Another hallmark of the company's culture was that there was little formal training of reporters; new hires were often thrust into a "sink-or-swim" situation of reporting on an unfamiliar subject. Yet, UP/UPI became a training ground for generations of journalists. They were weaned on UP's famous and well-documented (though frequently misappropriated and misquoted) slogan of "Get it first, but FIRST, get it RIGHT." Despite that, like all agencies that deal with huge volumes of timely information, UP and later UPI had its share of remembered mistakes. As recounted in the various printed histories of UPI cited below, the most famous one came early in its history. UP's president, Roy Howard, then traveling in France, telegraphed that the 1918 armistice ending World War I had been declared four days before it happened. 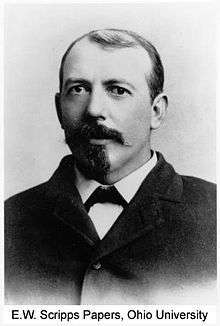 Howard's reputation survived and he later became a Scripps partner, whose name appeared in one of the Scripps subsidiary companies, Scripps-Howard. But the mistake dogged UP/UPI for generations. Still, the agency's reporters were often able to tell stories more quickly and accurately although they were usually outnumbered by the competition. In 1950, for example, UP reported the invasion of South Korea by North Korea two hours and forty minutes before its archrival, the AP. The New York Times later apologized to UP for refusing to print information on the invasion until the AP had confirmed it. Bartholomew succeeded in putting the "I" in UPI on May 24, 1958, when UP and INS merged to become United Press International. The new UPI now had 6,000 employees and 5,000 subscribers, about a thousand of them newspapers. Rival AP was a publishers' cooperative and could assess its members to help pay the extraordinary costs of covering major news—wars, the Olympic Games, national political conventions. UPI clients, in contrast, paid a fixed annual rate; depending on individual contracts, UPI could not always ask them to help shoulder the extraordinary coverage costs. In its heyday, newspapers typically paid UPI about half what they paid AP in the same cities for the same services: At one point, for example, the Chicago Sun-Times paid AP $12,500 a week, but UPI only $5,000; the Wall Street Journal paid AP $36,000 a week, but UPI only $19,300. The AP, which serviced 1,243 newspapers at the time, remained UPI's main competitor. In 1959, UPI had 6,208 clients in 92 countries and territories, 234 news and picture bureaus, and an annual payroll of $34,000,000, ($276,463,470) in today's dollars. Under pressure from some of E.W. Scripps' heirs, the Scripps company, which had been underwriting UPI's expenses at a loss for at least two decades, began trying to transfer control of UPI in the early 1980s. It tried to bring in additional newspaper industry partners and when that failed, engaged in serious negotiations with British competitor Reuters, which wanted to increase its US presence. As detailed in "Down to the Wire", by Gordon and Cohen, cited below, Reuters did extensive due diligence and expressed an interest in parts of the UPI service, but did not wish to maintain it in full. Scripps wound up giving the agency away to two inexperienced businessmen, Douglas Ruhe and William Geissler, originally associated with two better-known partners, who soon departed. Ruhe and Geissler obtained UPI for $1. Under the terms of the purchase agreement, Scripps first injected UPI with a $5 million cash balance, which compared to the $1.0 - $1.5 million per month that UPI was already losing. Facing news industry skepticism about their background and qualifications to run an international news agency, Ruhe and Geissler watched an increase in contract cancellations. Despite serious cash flow problems, they moved UPI's headquarters from New York City to Washington, DC, incurring additional major costs due to construction cost overruns. During this period, UPI's 25-year-old audio news actuality service for radio stations was renamed the United Press International Radio Network. But faced with recurring cash shortages and difficulty meeting payroll, the Ruhe-Geissler management sold UPI's foreign photo service and some rights to its US and foreign photos to the Reuters news agency. It also sold UPI's photo library, which included the archives of predecessor Scripps photo agency Acme and the pictures and negatives of International News Photos, the picture component of Hearst's INS to the Bettman Archive. Bettman was later sold to Microsoft founder Bill Gates's separate Corbis Corporation, which continues to control the images of UPI and its predecessor agencies, storing them underground in Pennsylvania and digitizing them for licensing, frequently without any notation of their UPI origins. In August 2011 Corbis announced a deal with AP to distribute each other's photos to their clients, effectively combining the pre-1983 UPI library with that of its former main rival for some marketing purposes. Despite losing a long battle with the Associated Press, United Press International's legacy was recognized by AP when it made the UPI mantra "get it first but get it right" a cornerstone of a branding campaign launched on ap.org. UPI was purchased in May 2000 by News World Communications, a media conglomerate founded by Unification Church founder Sun Myung Moon, which also owned The Washington Times and various newspapers in South Korea, Japan, and South America. The next day, UPI's White House correspondent, Helen Thomas, resigned her position, after working for UPI for 57 years. As of March 2011, the UPI.com website reported that the organization is headquartered in Washington, D.C., with other addresses in Seoul, South Korea; Beirut, Lebanon; Tokyo, Japan; Santiago, Chile; and Hong Kong, China. The Santiago, Chile office was closed on November 1, 2014. While much of normal news agency work is little publicized, many UP/UPI news staffers did gain fame, either while with the agency or in later careers. They included journalists, news executives, novelists and high government officials. Among them were Walter Cronkite, David Brinkley, Edwin Newman, Bob Considine, Harrison Salisbury, Jim McGlincy, several of the core members of Edward R. Murrow's famed Murrow's Boys: Charles Collingwood, Eric Sevareid, Richard C. Hottelet, Howard K. Smith, Larry LeSueur, and Bill Downs. The founding director of CBS News, Paul White, for whom the top award given by the broadcast news directors organization Radio Television Digital News Association (RTDNA) is named, Kent Cooper, who later became the longtime GM of rival Associated Press, early ABC News president Elmer Lower, Pulitzer Prize–winning newspaper editor and columnist Eugene Patterson, Raymond Clapper, originator of the term "smoked-filled room", Merriman Smith, Helen Thomas, Marie Colvin, Martha Gellhorn, Kate Webb, Henry Tilton Gorrell, Seymour Hersh, Lucien Carr, Cyrus Leo Sulzberger II, Neil Sheehan, Brit Hume, co-founder of CNN and Food Network Reese Schonfeld, Keith Olbermann, Steve Wilstein, who later broke the steroids scandals in baseball for the AP, New York Times columnists Thomas Friedman and Gail Collins, Washington Post columnist Richard Cohen, sportswriter and Untouchables co-author Oscar Fraley, author H. Allen Smith, military author Joe Galloway, Saigon evacuation photographer Hubert van Es, photographers Stanley Tretick, Stan Stearns,1970s White House photographer David Hume Kennerly, White House spokesmen Stephen Early, George Reedy, Ron Nessen and Larry Speakes, Canadian journalist, author Knowlton Nash, former executive and senior anchor of CBC Television's flagship news program, The National, longtime Las Vegas bureau manager Myram Borders, onetime CIA Director Richard Helms, who interviewed Adolf Hitler for United Press during the 1936 Olympics, diplomat Edward M. Korry, South American correspondent and Bureau Chief David Belnap (winner of the Ed Stout award of the Overseas Press Club and the Maria Moors Cabot Prize), former UP correspondent to Moscow Eugene Lyons, longtime NCAA chief Walter Byers, C-SPAN founder Brian Lamb, ex-Dow Jones CEO Les Hinton, 1980s–90s Singapore President Wee Kim Wee and novelists Allen Drury, Robert J. Serling, Tony Hillerman and Daniel Silva. Veteran foreign correspondent Arnaud de Borchgrave worked for UP / UPI both early and late in his career, some fifty years apart. Naked City photographer Weegee and 60 Minutes creator and producer Don Hewitt worked for UP Newspictures predecessor Acme Newsphotos. UPI reporters and photographers have won ten Pulitzer Prizes: Russell Jones (International Reporting, 1957), Andrew Lopez (News Photography, 1960), Yasushi Nagao (News Photography, 1961), Merriman Smith (National Reporting, 1964), Kyoichi Sawada (News Photography, 1966), Toshio Sakai (Feature Photography, 1968), Lucinda Franks and Thomas Powers (National Reporting, 1971), and David Hume Kennerly (Feature Photography, 1972), John H. Blair (Spot News Photography), a special assignment photographer for UPI, 1978; and an originally unnamed UPI photographer whose identity was withheld because of risk in revolutionary Iran. (Spot News Photography), 1980. Decades later, the photographer of "Firing Squad in Iran" was identified as Jahangir Razmi of Ettela'at, Iran. 1 2 3 4 5 6 7 8 9 Joe Alex Morris (1957). "Deadline Every Minute The Story of the United Press - ARCHIVE.ORG ONLINE VERSION". 1 2 3 4 "Scripps-Howard". Ohio History Central. ohiohistory.com. 1 2 3 "UPI History". UPI History. United Press International. 1 2 3 4 5 6 Atwater, James D. (December 24, 1989). "U.P.I. : Look Back in Sorrow (book review of Down to the Wire: UPI's Fight for Survival By Gregory Gordon and Ronald E. Cohen)". The New York Times. Retrieved March 15, 2011. 1 2 NY Times staff reporter (September 18, 1991). "U.P.I. Cuts More Employees". The New York Times. Retrieved March 16, 2011. 1 2 3 4 "UPI Staff Cuts Include White House Correspondent". Editor & Publisher. July 11, 2007. Retrieved March 15, 2011. ↑ News World Communications no longer owns the Washington Times. CJR staff (December 22, 2010). "Who owns what - News World Communications, Inc". Columbia Journalism Review. GolfStyles Magazine, Middle Eastern Times, The Segye Ilbo (South Korea), The Sekai Nippo (Tokyo), Tiempos del Mundo (Online Only), The World and I. Wire Service: United Press International (UPI). ↑ "About United Press International Products". United Press International. Retrieved July 11, 2011. 1 2 3 4 5 6 7 8 9 10 11 12 13 14 15 16 17 "Upi R.i.p. As A New Book By Two Veterans Of United Press International Shows, The World Lost More Than A Scrappy Wire Service When Upi Died. It Lost A Vital Witness To History". Chicago Tribune. May 4, 2003. 1 2 3 4 5 6 Spiegel, Peter (June 1, 1998). "Old dog, new tricks?". Forbes. Retrieved March 15, 2011. 1 2 3 4 Staff reporter (June 2, 1958). "The Press: New York, May 24 (UPI)". Time. 1 2 N.Y. Times staff reporter (April 27, 1960). "U.P.I. Calls 1959 Its Biggest Year - News Agency Head Reports a Record Clients Roll of 6,208 in 92 Countries". The New York Times. Retrieved March 16, 2011. 1 2 Gary Haynes (2006). "A History of United Press International Newspictures Service". Retrieved August 2, 2011. 1 2 3 "UPI Radio: 40 Years Of Sound". Radio World. IMAS Publishing. 1999. Retrieved July 26, 2011. ↑ NY Times staff reporter (June 26, 1984). "Photo Accord". The New York Times. Retrieved March 16, 2011. ↑ Kaplan, David (August 23, 2011). "The AP And Corbis Combine Image Libraries In Distribution Deal". GigaOM: paidContent. Retrieved March 9, 2013. 1 2 Jones, Alex S. (August 28, 1991). "The Media Business; U.P.I. Planning to File for Bankruptcy Protection Today". The New York Times. Retrieved March 16, 2011. ↑ Stout, David (May 17, 2000). "Helen Thomas, Washington Fixture, Resigns as U.P.I. Reporter". The New York Times. Retrieved March 15, 2011. 1 2 Joe Strupp (July 12, 2007). "UPI Closing Long-Running U.N. Bureau, Most Senior Reporter Laid off". Editor & Publisher. Retrieved March 16, 2011. ↑ "UPI's journalism mentoring program for students worldwide". United Press International. Retrieved March 16, 2011. ↑ "About United Press International". United Press International. Retrieved March 16, 2011. ↑ "Agencia UPI cierra y libera en imágenes parte de la historia reciente de Chile". El Desconcierto (in Spanish). 30 October 2014. Retrieved 27 August 2016. ↑ Hevesi, Dennis (August 1, 2011). "Elmer Lower, Former President of ABC News, Dies at 98". The New York Times. Retrieved August 14, 2011. ↑ Shapira, Ian (October 25, 2011). "How a letter on Hitler's stationery, written to a boy in Jersey, reached the CIA". The Washington Post. ↑ "Pulitzer Prize winners". Pulitzer.org. ↑ "UPI History Milestones 1907 - 1910". UPI - Centennial Anniversary. United Press International. 2007. Retrieved March 16, 2011. ↑ "United Press International Unifax Machine in Use". Corbis Images. Retrieved March 16, 2011. ↑ "UPI History Milestones 1921 - 1940". UPI - Centennial Anniversary. United Press International. 2007. Retrieved March 16, 2011. 1 2 3 4 "UPI History Milestones 1941 - 1960". UPI - Centennial Anniversary: 1907 - 2007. United Press International. Retrieved March 15, 2011. ↑ "UPI History Milestones 1961 - 1980". UPI Centennial Anniversary. United Press International. 2007. Retrieved March 16, 2011. ↑ "UPI History Milestones 1981-2000". UPI Centennial Anniversary. United Press International. 2007. Retrieved March 16, 2011.